If you enjoy online slots and also betting on football then head over to BetVictor Casino where they are offering members a £5 bonus sports bets. All you have to do is visit the casino and opt in to the promotion. 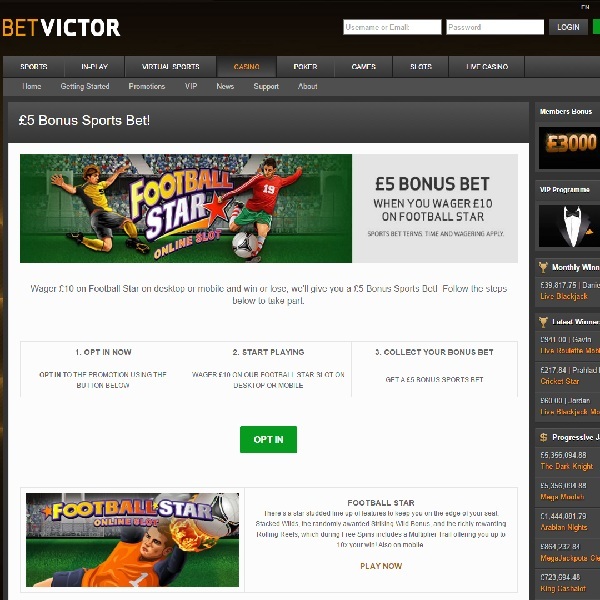 Then start playing Football Star slots and once you’ve bet £10 on it you will be rewarded with a free £5 sports bet at the BetVictor sportsbook. The promotion ends tonight at midnight so be sure to head over there as soon as possible and start playing the game. Football Star is a 5 reel slot that anyone who is a fan of the sport is sure to love. It features stacked wild symbols, a randomly awarded Striking Wild Bonus, the hugely lucrative Rolling Reels feature and a free spin round with multipliers of up to 10x.